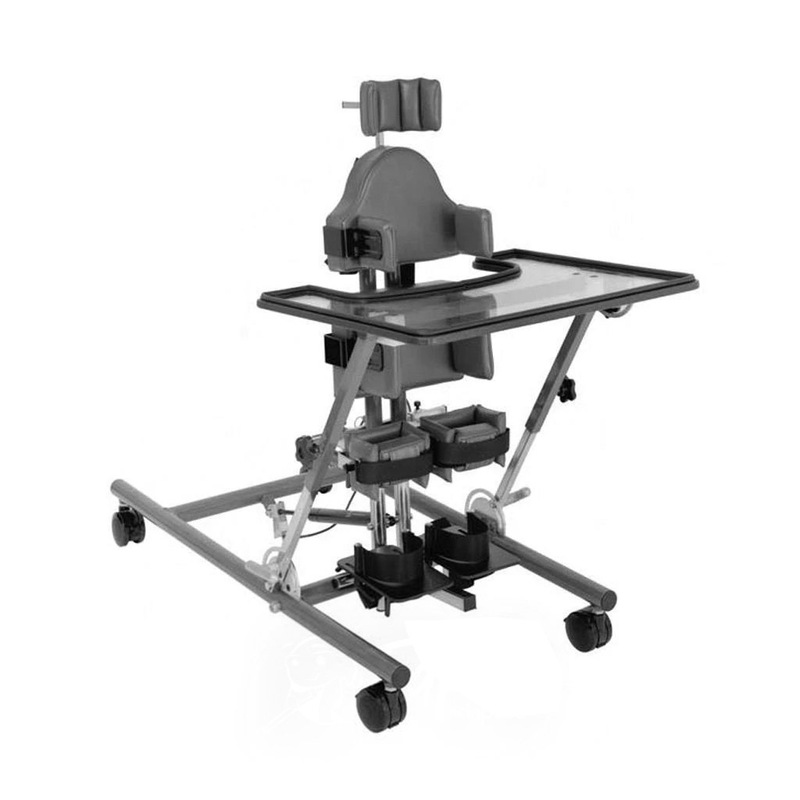 Prime Engineering superstand stander is amazingly versatile, handling the needs of clients without any additional parts and switch from supine to prone or upright standing in literally seconds without using any tools. 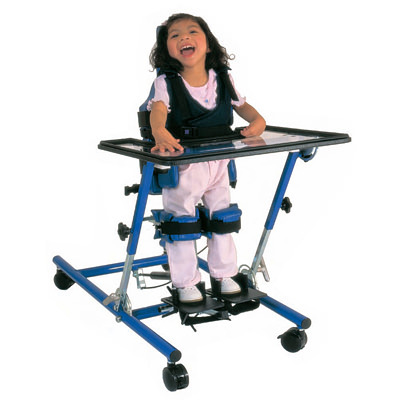 Superstand stander has foot plate system that independently adjusts on all planes; toe in, toe out, planter flexion/dorsi flexion and independent height and depth adjustment which can be achieved without tools and knee blocks adjust in and out, up and down and side to side. 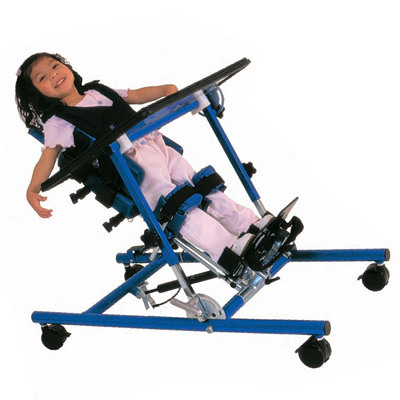 Prime superstand stander offer a ½" headrest receiver as standard equipment and both hip and chest system have width adjustable hip guides/lateral pads, with a choice of 90° brackets, 1" offset or 2" offset. Superstand stander has chest harness and pelvic pad which are made of soft denim and are machine washable. Prime stander has unique hydraulic actuator which works smoothly and safely allowing user to change the mast angle in a slow controlled manner. Superstand comes standard with 3½" H x 3½" D chest laterals and 5½" H x 4" D hip laterals with 90° brackets. Superstand youth comes standard with 6½" H x 4½" D chest laterals and 6½" H x 4½" D hip laterals with 90° brackets. Adjustability and comfort: Prime Engineering superstand stander has tool-free adjustments which allow easy changes to user body support pads, headrest, chinrest, footrest, knee supports, support straps, chest harness and standing angle. 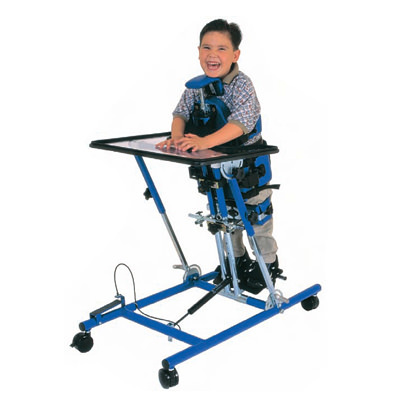 Superstand stander provides multiple range of standing angle adjustment which allows for ease of client positioning, adjustment and weight loading. Soft padded positioning supports, cushioned straps and complete adjustability which helps in properly position of the user and increase the standing time and tolerance. Growth: Superstand fits clients from 26" - 48" and superstand youth fits clients from 40" - 60" allowing for maximum growth throughout each individual standing program, while maintaining the full positioning capabilities of the superstand. User height Supine 26" - 48", Prone 30" - 50" 40" - 60"
Weight capacity 125 lbs. 150 lbs. Width adjustment (90° brackets) 9" - 13" 11" - 15"
Width adjustment (1" offset brackets) 7" - 11" 9" - 13"
Width adjustment (2" offset upgrade brackets) 5" - 9" 7" - 11"
Other Components: Upholstery, plastic parts, painted surfaces, rubber parts, bearings, casters and other parts not specifically identified above, all of which are warranted against defects in material and workmanship for three months from the original purchase date, subject to the following terms and conditions, and limitations.